I will need to someday go back and reread this more thoroughly because I only read specific chapters this time around. But one of the things I found really interesting was Schechner's interest in anthropology and ethology. In all of the chapters I read, Schechner included speculations about the performance/ritual habits of early humans, and he generally discussed the performance/play/ritual of other primates (and sometimes other types of animals). It seems like he spends more time mining these anthropological and ethological premises for insight than he does discussing actual contemporary performance styles. He functions under the assumption that these ancient or animal performances give us valuable insight into how human performance, ritual, theatre, drama, and play are structured. I'm not saying I think he's wrong, but it is an interesting approach. 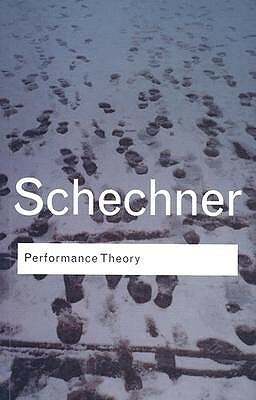 Schechner approaches the complicated notion of "performance" by teasing out subcategories, such as theater, ritual, sports, games, and play. Thought-provoking, digestible prose, interesting examples and diagrams, and pictures of chimpanzees. The reader is likely to become more self-conscious of interactions between people. Maybe to the point of obsession. This book is O.K. I like the diagrams he has drawn. Though I would really rather read some of the sources he refers to: The Presentation of Self in Everyday Life, Theater of the Opressed, and From Ritual to Theater: The Human Seriousness of Play. Maybe the problem is that I am reading the 1988 version of Schechner's book instead of the most recent one. The author proposed a very interesting comparative standpoint towards performance types, what he calls himself "horizontal" assessment, rather than "vertical" classic approach on exploring performance theory. I mostly appreciate his concrete examples to support the details of his theory.